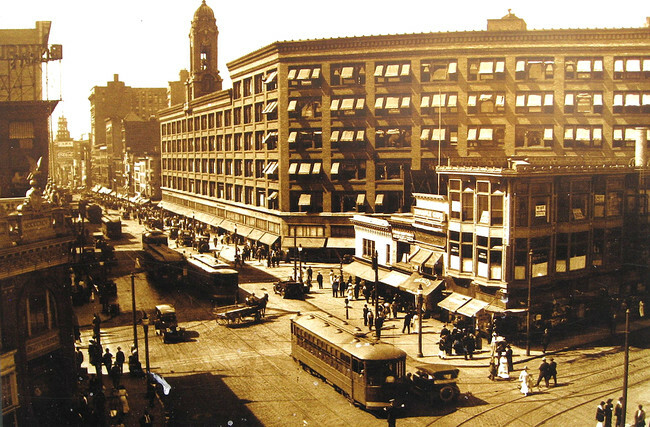 The renovation and adaptive reuse of a historic department store building is just one of many projects that are a collective attempt to revitalize the upstate New York city. 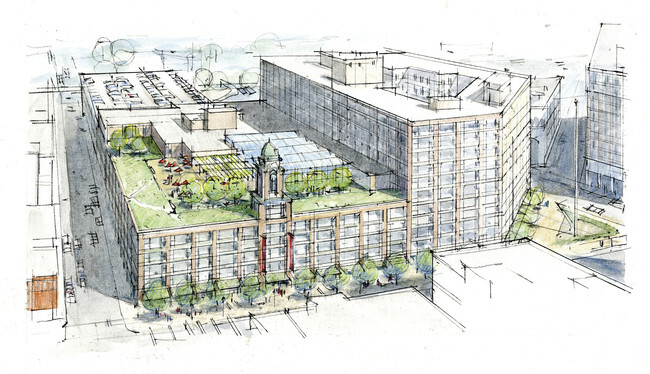 Continuing efforts to revive Rochester, New York, after decades of decline, The Architectural Team (TAT) has embarked on a plan to transform a former department store into a mixed-use complex that will have apartments, offices, and a rooftop garden. 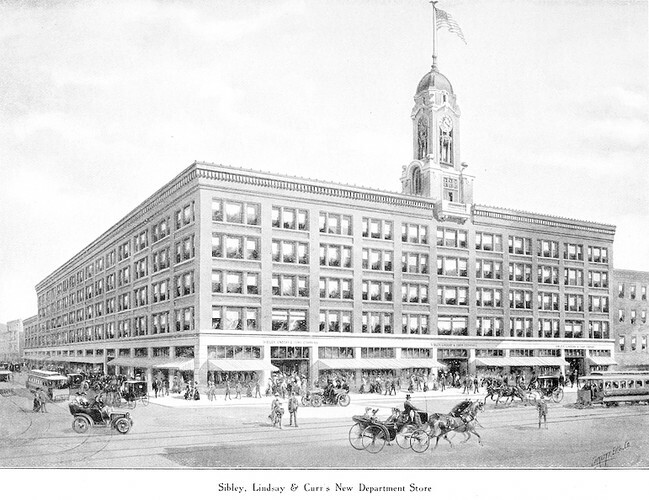 The $200 million plan, which is in partnership with the WinnCompanies, an adaptive-reuse developer, focuses on a store known as Sibley’s (Sibley, Lindsay & Curr Company), which was a much-loved retail fixture in the upstate city from around the Civil War until 1990. It’s a hopeful project for a city whose overall population dipped four percent from 2000 to 2010, according to city officials. The Eastman Kodak film company, an influential Rochester corporation that employed tens of thousands of people, declared bankruptcy in 2012, adding to Rochester’s woes. But the Rochester Downtown Development Corp., a nonprofit promoting the city’s renaissance, says the downtown population grew by almost 12 percent in the same decade, which by some estimates has pushed down the residential vacancy rate to less than five percent. “The table has been set,” says Joseph Eddy, Winn’s vice president of development. In fact, $755 million of projects are underway downtown, and 38 office buildings have been converted to apartments since 2000, according to the Development Corp. And the trend continues: One of the residential pioneers, the Temple Building, a 14-story former Baptist church that faces Sibley’s, is now creating an additional 30 units on four of its floors. Offices are to be installed in the lower floors of the window-lined building; the oldest section dates to 1905 and was designed by local architect J. Foster Warner. His commissions included homes for George Eastman, the founder Eastman Kodak. The apartments will be tucked in the upper floors of the 12-story tower portion of the building, which dates to 1926 and offers views of Lake Ontario. Also planned is a 230-space underground parking garage, street-level shops, and a garden, with lawns and seating areas, on the roof of the lower section of the L-shaped structure. Since buying the site in 2012, Winn has taken small steps forward. Last year, it built a police station in a storefront on the site, next to a new daycare center. Also, as part of the same $4 million initial phase, workers have repointed exterior walls, hung brown and cream awnings, and rehabbed original nickel and brass escalators. They’ve also partly renovated a soaring central atrium, whose floor clock was a popular meeting spot for shoppers during Sibley’s heyday. For a time, the store, which also sold baked goods and had on-site barbershops, was the largest of its type between New York and Chicago, according to some historical accounts. But besides a handful of friezes and Art Deco elevator doors, many of the building’s historic details have been lost. “The transition over the years has not been kind to the building,” says Binette. The next step, to start constructing the apartments and offices, is supposed to start by the end of the year, says Eddy. But the $38 million phase is dependent on a slew of public financing, including state and federal tax credits, that won’t be awarded until April, he says. Under The Architectural Team's plan, the Sibley's building would gain several hundred thousand square feet of office space, nearly 200 apartments, an underground parking garage, street-level shops, and a roof garden. Though Rochester is betting that a growing population will fuel its latest stab at renewal, offices are getting some attention, too. Under construction is Midtown Rising, a one-million-square-foot mixed-use project across from Sibley’s. It will replace Midtown Plaza, a mall-centered development by architect Victor Gruen built in the early 1960s. While much of the plaza’s sprawling nine-acre plaza site has been razed, the city preserved the Seneca Building, an office building. Also saved was the 17-story Midtown Tower, which will have offices and 182 apartments. Infrastructure is being improved as well. To alleviate sidewalk congestion along Main Street, where buses queue to pick up passengers, the city is building a $50 million downtown bus terminal with 30 bays across 87,000 square feet. A sunken highway blamed for severing neighborhoods when it was constructed in the 1950s is also targeted. The city seeks to raise a portion of it to turn it into an at-grade street.